"Suffering Silence are an alternative metal band from London, England. Suffering Silence musial style has a combination of raw and clean vocals with rap style undertones mixed into heavy guitar riffs and hard driven drum beats. Their image mainly portrays themselves as animated characters (similar to Japanese Anime/Manga), drawn by the bands bassist April “Apes” Finn. 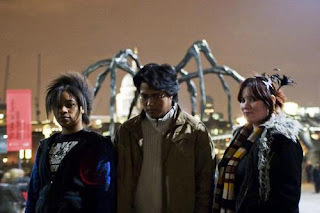 The bands musical influences include Linkin Park, Lamb of God, Eminem, Pussycat Dolls, Zero 7, Muse, Green day, Lost Prophets, Dir En Grey and Timbaland. As quoted by the band, Suffering silence are ‘’ ‘Just a band with a plan, ending the silence with a little something we like to call music’ ‘’. Their second album ‘Revolution’ is out now and available for free download." I like this band... they are very young but the amount of potential they have is incredible. Who knows what the future holds for them!